Asus has a strange history in regards to showing some 3D monitors at events such as CES or CeBit and these monitors never actually appearing on the market. They are trying to be first, but only in showing a prototype on a big event and then releasing a different product on a market at a later time. This already has happened with the Asus VG242H that never came to the market, but instead Asus VG236H was released at a later time. 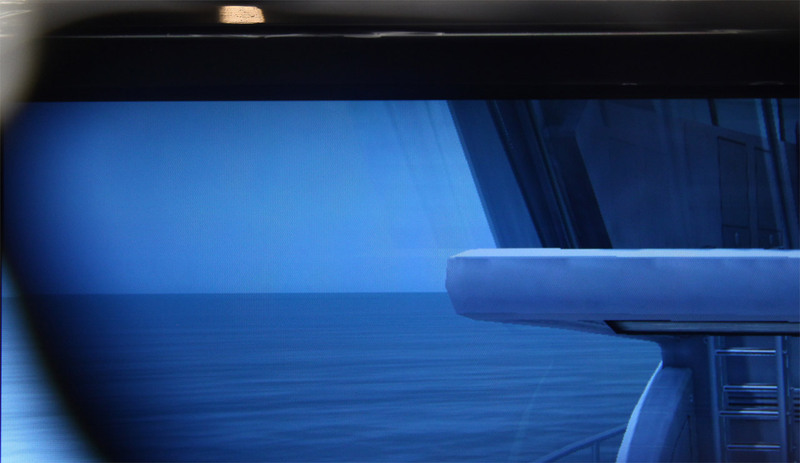 Then Asus was the first company to show a 27-inch 3D monitor that months later again has never appeared on the market and now at CeBit 2011 Asus is showing a new 27″ model, the Asus VG278H that we are probably soon going to have on the market… hopefully as early as April. 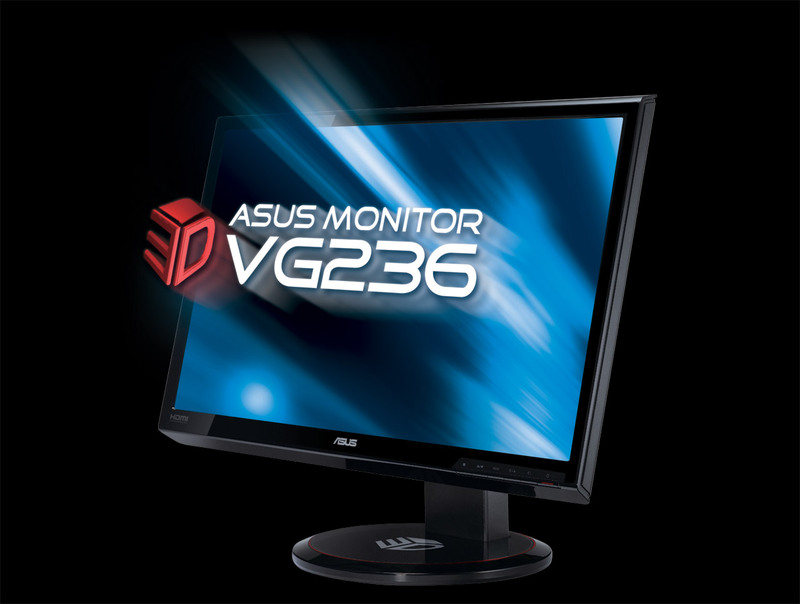 The 27-inch Asus VG278H 3D monitor follows the general design of the smaller VG236H monitor the company released last year, but there are some differences as well. The new 27-inch model apparently will be using a LED backlight, will have a built-in 3D Vision IR emitter and also have support for stereo 3D over the HDMI 1.4 interface. I expect that it will be pretty similar in terms of performance to what the 27-inch Acer 3D monitor that I’ve already reviewed, but we’ll have to wait a bit more to see. * Have in mind that the stereo 3D mode is only usable with a Dual-Link DVI cable and through that interface on the monitor, as neither the Component, nor the HDMI do support stereo 3D!!! Asus VG236HE is one of the latest 120Hz 3D-capable LCD monitors compatible with Nvidia’s 3D Vision technology, but what sets it apart from all other such products is the fact that this is the first 3D-capable 120Hz LCD monitor with a glossy screen, as all others so far were with matted screens (not counting the 120Hz LCD panels used in 3D-capable laptops that are also glossy). Now this kind of reflective coating over the screen can create some reflections when darker image is being displayed and some people do not like that much, although more and more monitors in general are being made like that, but you can get used to that or just avoid it by choosing another product. The reflections on the glossy screen are visible only when you have dark image shown on screen and you have some light coming either from the lamp in the room or from the sun outside. However following Nvidia’s recommendations you should play in stereo 3D with no external light and in a dark room for best results and in such case the glossy surface should not be an issue whatsoever. Of course you can get used to it after a while, so the occasional reflections you will see won’t bother you, but it is a matter of personal preference and it is not like you don’t have a choice of other 120Hz 3D-capable LCD monitors with a matte surface. With that said, the glossy screen has some advantages too and these are in the form of more vibrant colors you get, deeper black and brighter white as well as more sharper looking image and these do have their own appeal for the users that are Ok with the side effects in terms of the occasional reflections in some conditions. 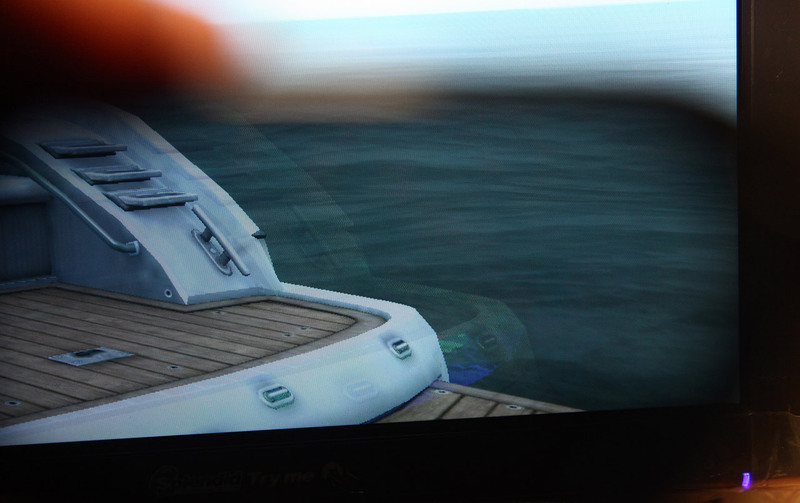 But how does the glossy screen affect the monitor when you are using it in stereo 3D, well I strongly suggest that avoid playing in S3D mode on a darker games where you have reflections on the screen as it creates a weird feeling and may lead to faster tiring for the eyes. So just keep up with the recommendations to use the monitor in a darkened room with no external lights or best experience when playing in stereo 3D mode. Another thing worth mentioning is that the Asus monitor barely has any backlight bleeding, aside from the top and bottom edges of the screen, where it is kind of expected to have a bit higher brightness. Now let me just show you how the monitor performs in terms of input lag. I’ve compared it to the LG W2363D-PF, as this model from LG is the last Full HD 3D-capable 120Hz LCD monitor that I’ve tested and that does not have input lag when the special THRU Mode is active. I’ve used a DVI splitter cable I connected both the Asus VG236HE and the LG W2363D-PF and started testing for input lag with the LG in its THRU mode and the Asus set in its gaming mode. As you can see from the photo above, there were moments when the LG and Asus were performing the same, meaning that there was no input lag at the specific moment, unfortunately the situation was not like that all the time. The minimum input lag measured on the Asus was indeed 0 milliseconds, meaning no delay at all from the moment of receiving the image and displaying it on the screen, however the average and maximum delay was more than zero. The maximum input lag I was able to measure was 17 milliseconds which is not that bad, but for a high-end gaming monitor with 120Hz refresh rate and intended for playing games in stereo 3D mode one would expect to have no input lag at all, right? And the average delay measured was about 8 milliseconds for the Asus as compared to the LG, that has no input lag at all or at least it is much less than one millisecond making it really insignificant and hard to measure anyway. 8 milliseconds was the average input lag measured from the sequence of over the 300 photos, taken in high-speed mode with a digital camera, of the timer you see shown on both displays. So the Asus doesn’t seem so appealing anymore for more demanding gamers, looking to use it in 2D mode with the full 120Hz refresh rate instead to play in stereo 3D mode. 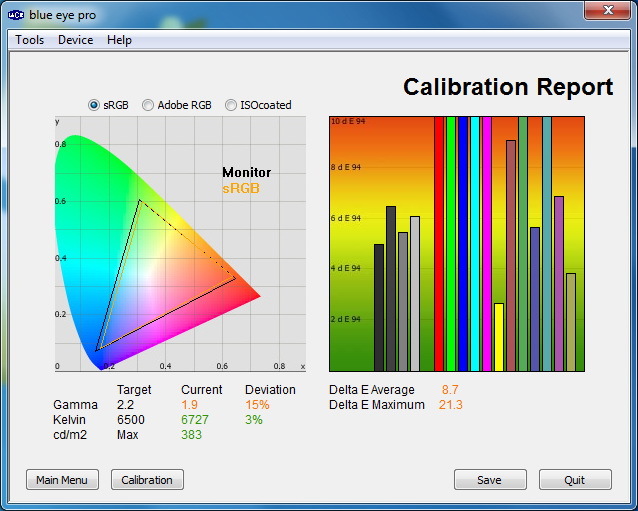 Measuring the color accuracy of the display with factory settings revealed that there are some quite high deviations from the reference values of a color calibrated display. That however is to be expected as the Asus VG236HE is a high-brightness display (400 cd/m2 by specifications) and it is designed to be used for gaming in stereo 3D mode. That is why Asus probably have decided to turn up the default settings for higher brightness instead of color accuracy, as when wearing the 3D Vision active shutter glasses some of the light coming from the monitor is blocked. So instead of being optimized for use in 2D or plain 3D mode, the default settings are definitely designed for stereo 3D mode and the colorimeter has show quite high brightness level – 383 cd/m2 with the factory settings. The level of the black color measured with the factory settings was quite high at about 0.44 cd/m2, but that is to be expected with such high brightness, but still the contrast level was quite good with a ratio of 944:1. 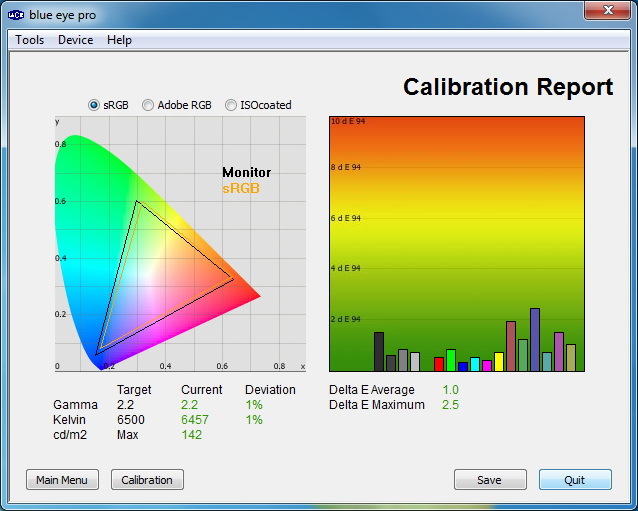 You can however calibrate the color accuracy of the Asus VG236HE to a pretty decent levels as you can see from the image above, just compare the deviation (delta E) before and after the calibration and an average of Delta E of 1 you can say that the colors are quite good for a TN panel. However there is a side effect after the calibration and that is the fact that you need to significantly lower the brightness in order to improve the color accuracy. The maximum brightness was just 142 cd/m2, with a black point measured at 0,29 cd/m2 and a bit disappointing contrast level of just 503:1. But this was completely expected as all 120Hz 3D-capable displays are mostly designed for gaming (plain 3D and stereo 3D) and multimedia use and not for working with colors. So calibration is in order only if you need it and will not play in stereo 3D mode, but then again why would you need to buy this monitor, instead of a cheaper 60Hz model? And now it is time for some testing of the stereo 3D capabilities of the display. I’m starting with the crosstalk (ghosting) as this is currently one of the major issues that all 3D LCD monitors have more or less trouble with. 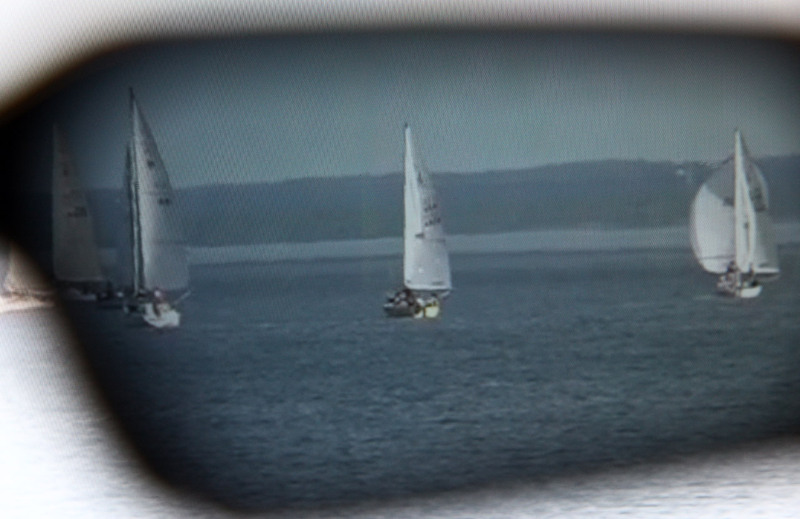 The first test is with the sailboats 3D video that I find great for testing crosstalk as it has higher separation and higher contrast and is thus prone to having more ghosting than usual videos that were shot and post-processed to minimize all possible issues. Looking at the sails of the boat you can barely see some ghosting on their left side (the photo was taken through the right lens of the shutter glasses) and that shows quite good performance in terms of crosstalk. So far things look a bit better than on the LG W2363D and the Acer GD245HQ that I’ve tested earlier this year in terms of crosstalk, it seems that Asus were able to further lower the negatives from that. Switching to a game in stereo 3D mode and that game being Tomb Raider Underworld I’m going for further testing of the crosstalk exhibited by the Asus monitor. TRU is one of my favorite test tools for that, because the game looks and performs great in stereo 3D mode with 3D Vision, but it also has some great scenes that work perfect for checking out the level of ghosting. Of course in order to make the ghosting more visible the level of separation has to be increased quite a lot. 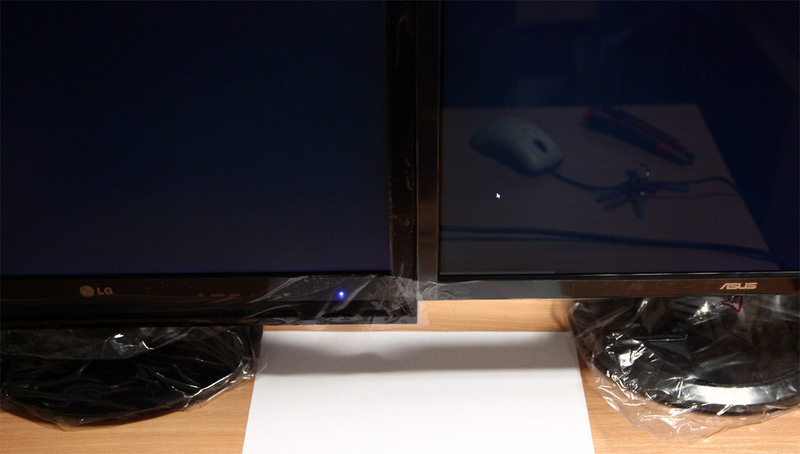 As you can see from the photo above, the ghosting at the top of the screen is not that much as on previous monitors I’ve tested, although it is still present as expected. The bottom of the display also reveals more ghosting then for example the center of the display, but that is also to be expected. Here the level of crosstalk is pretty much the same as on the LG and there is also some visible color ghosting and the responsibility for that goes to the OverDrive function used to drive the pixels’ response time to a lower value. 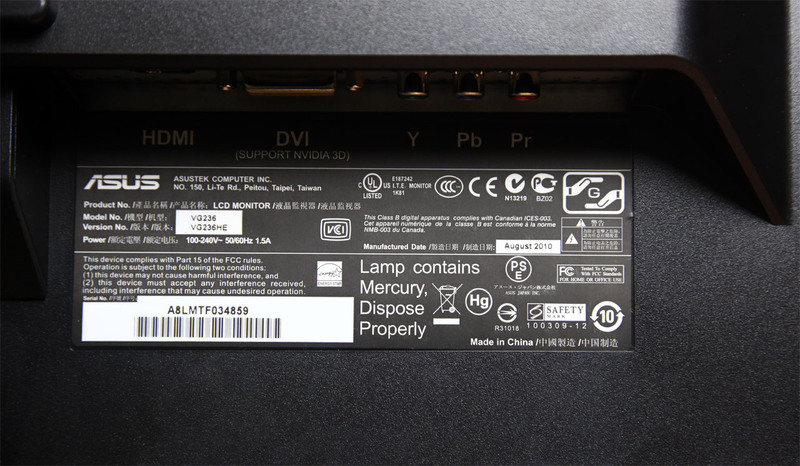 This monitor does not feature an OverDrive control function that will allow you to disable and enable it at will, although disabling it in stereo 3D mode will significantly increase the level of ghosting, so there is no point for that. In 2D mode you have the “Trace Free” option that apparently can influence the OverDrive function in some way, but changing it hardly makes any visible change int he performance. The good news here for the people that are not happy with the over-sharpening of some other monitors in 2D mode is that here we don’t have that problem. 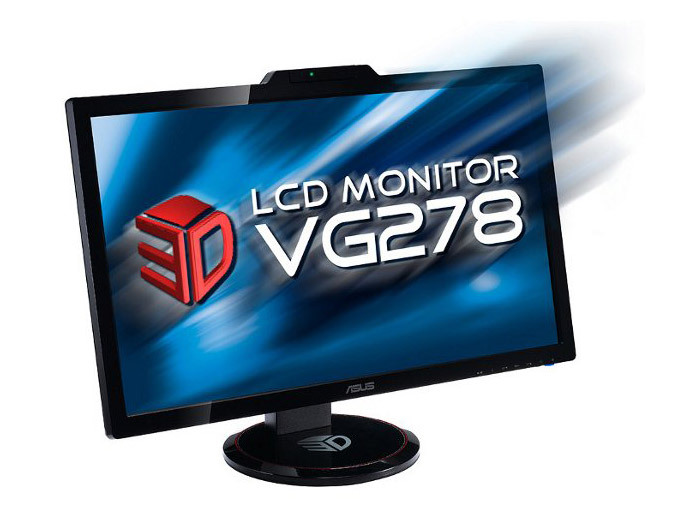 In general I can say that I’m quite satisfied with the performance of the ASUS VG236HE monitor. It shows good potential and works well enough, with further reduced crosstalk as compared to the competition. The rotating and height adjustable stand as well as the presence of component input also makes the monitor more flexible, although these are not directly related to the performance in stereo 3D mode, they just contribute to the overall picture. I was a bit disappointed from the presence of some input lag even in gaming mode, something that is not desirable for a higher-end gaming product such as this display, but is not actually that much of an issue for stereo 3D gaming for most people. The glossy surface of the screen adds in some advantages, but also comes with a disadvantage and that is the reflections that you may see, but liking that or preferring a matte screen is a matter of personal preferences and following the guidelines for best results in stereo 3D mode that shouldn’t be much of a bother anyway (ie playing in a dark room with no external light). 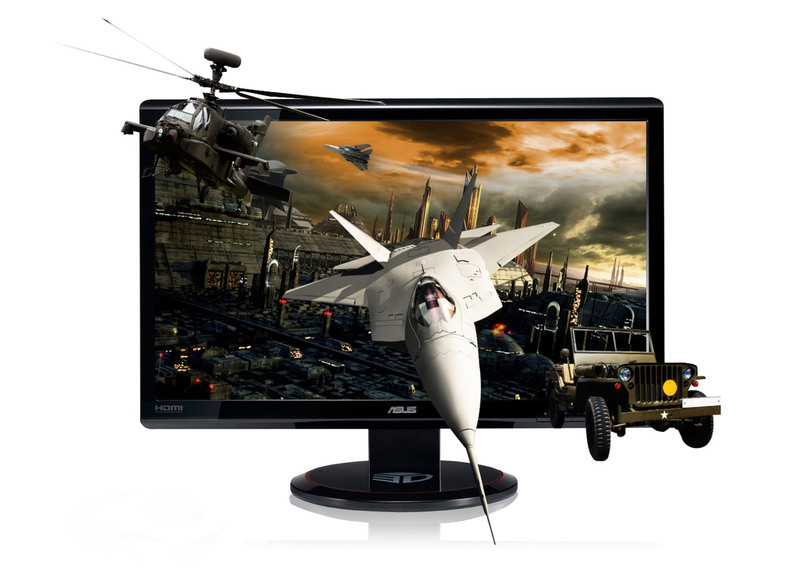 So all in all a ASUS VG236HE is a good monitor for use with stereo 3D with both pros and cons, so whether you like it or not depends more on your personal preferences than on the performance and the results it displays.